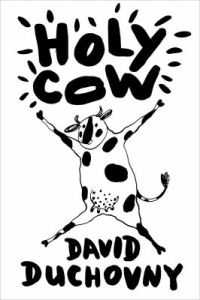 The review I initially read about Hol y Cow by David Duchovny must have been a good one because it led me to the book. Allegory with animals usually irk me. My interest was sparked enough for me to place the hold and then to actually give the book a try once I had it home. I started it on a Saturday. If I had more time that day, or that weekend, I would have finished it in a sitting or two. With just over 200 pages the time commitment wasn’t long, but finishing it quickly was more due to the fact that I was immediately drawn into the story. A bit of a surprise to myself, I fully enjoyed Elsie’s distinct voice and spunky character. How well Duchovny blends humor, life philosophy and social commentary as the three main characters (Elsie, a cow; Jerry/Shalom, a pig; and Tom, a turkey) search for safety, fulfillment, and “home” captivated me. When I read the author note stating that the events in the book are unrealistic I was amazed. No, I wasn’t amazed because I had taken them at face value, but because it had to be pointed out to me. Until I read his acknowledgment I had not thought about it; I simply enjoyed and appreciated the ride.